Looking for more Famous Freemasons? 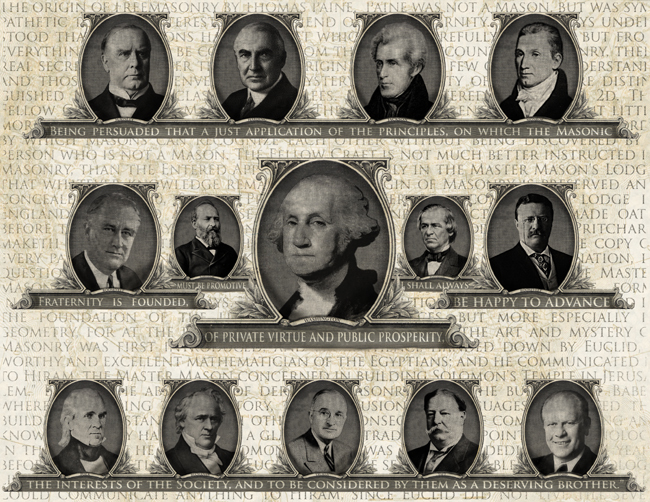 Many believe that every U.S. President was a Freemason. But, there were only a few Freemason Presidents in the long line of Americas Executive office. Among those President’s what also wore the Masonic Apron you will find a few familiar names among a few lesser known presidents. Along with their Masonic careers, so too will you discover a few lesser known facts that bear interesting consideration in light of their fraternal affiliation. George Washington became a Mason at age 20 in 1753. it is suggested that he may have attended approximately nine Masonic lodge meetings during the remaining 46 years of his life, and probably never presided over any lodge. Interestingly, brother George Washington took his oath of office as the first President of the United States with his hand upon a Bible from St. John’s Lodge No. 1,of the Ancient York Masons. Since then, George Washington’s Inaugural Bible has been used used for the inaugurations of Warren G. Harding, Dwight D. Eisenhower, Jimmy Carter, and George H. W. Bush. Additional use has been made in the funeral processions of Presidents Washington and Abraham Lincoln and in the center-stone laying of the U.S. Capitol, the addition of the Washington Monument, the centennials of the cornerstone laying of the White House, U.S. Capitol, and the Statue of Liberty, the 1964 World’s Fair as well as the launching of the aircraft carrier George Washington. The Washington bible is, interestingly, still in active use by St. Johns Lodge when not in civic display. Entered Apprentice in Williamsburg Lodge No. 6 at Williamsburg, VA., on November 9, 1775. Sadly there is no record of his taking any further degrees beyond the first. The records of Cumberland Lodge no. 8 in Tennessee, June 8, 1819, show a reception for Monroe as “a Brother of the Craft.” possibly a Master Mason in 1776. Said of the Masonic president James Monroe, he was an “Episcopalian of deistic tendencies who valued civic virtues above religious doctrine.” Stating in his first inaugural address the concept of religious freedom, “boasting that Americans may worship ‘the Divine Author’ in any manner they choose.” From The Religion of James Monroe, in the Virginia Quarterly Review, Autumn, 2003. It is suggested that President Jackson become a Mason in Harmony lodge No. 1 in Tennessee. Harmony Lodge began as No. 29 under the charter of North Carolina, later to be named No. 1 under the Tennessee grand Lodge in 1913. It has been said that Br. Jackson attended lodge at Clover Bottom Lodge under the Grand Lodge of Kentucky. He was present in lodge at Greeneville in 1801 and acted as Senior Warden pro-tem. The records of St. Tammany Lodge No. 29 at Nashville, which became Harmony Lodge no. 1 under the Grand Lodge of Tennessee, show that Jackson was a member. A very active Freemason, President Jackson served as the Grand Master of Tennessee Masons from 1822 to 1823. Master Mason 1820. EA, FC, MM, in Columbia Lodge No. 31, Columbia, Tenn., 1820, exalted a Royal Arch Mason in La Fayette Chapter No. 4 at Columbia in 1825. President Polk, as a Freemason and elected Commander in Chief, assisted in the cornerstone laying of the Smithsonian Institution in Washington, D.C. on May 1, 1847. In Polk’s career as president he oversaw the opening of the U.S. Naval Academy and the Smithsonian Institution, the groundbreaking for the Washington Monument, and the issuance of the first postage stamps in the United States. Master Mason 1817, Entered Apprentice Dec. 11, 1816, Lancaster Lodge No. 43, Lancaster, PA, Fellowcraft & Master Mason degrees in 1817. President Buchanan was the Junior Warden of his lodge from 1821 to 1822, and the Worshipful Master of the lodge in 1825. He was later exalted in Royal Arch Chapter No. 43, in 1826 going on to become Deputy Grand Master of the Grand Lodge of Pennsylvania. Master Mason 1851, Entered Apprentice, Fellowcraft, in Greeneville Lodge No. 119 now No. 3 at Greeneville, Tenn. In 1851, johnson was probably a member of Greeneville Chapter No. 82, Royal Arch Masons, as he joined the Nashville York Rite Commandery of Knights Templar No. 1 in 1859. President Johnson received the Scottish Rite degrees in the White House in 1867. Johnson joined the fraternity at the conclusion of his Senatorial term in the House of Representatives in 1843. Master Mason 1864, EA & FC Magnolia Lodge No. 20, Columbus, Ohio, MM Columbus Lodge No. 30, 1864, Affiliated with Garrettsville Lodge No. 246 in 1866, Affiliated with Pentalpha Lodge No. 23 Washington, D. C. as charter member in 1869. Exalted in Columbus Royal Arch Chapter 1866, and Knight Templar 1866, 14th Degree Scottish Rite 1872. In his time, Garfield is credited as being a Chaplin of a lodge that he held membership in. Politically interesting, Garfield supported articles of impeachment against President (and Masonic Brother) Andrew Johnson over charges that he violated the Tenure of Office Act by removing Secretary of War Edwin M. Stanton. Master Mason 1865, He is sometimes said to have received EA, FC, MM, in Hiram Lodge No. 10 in Winchester, West Virginia, in 1865, but William Moseley Brown is authority for the statement that this event took place in Hiram Lodge No. 21 at Winchester, Virginia in that year. McKinley affiliated with Canton Lodge No. 60 at Canton, Ohio in 1867 and later became a charter member of Eagle Lodge No. 43. He received the Capitular degrees in Canton in 1883 and was made a Knight Templar in 1884. President William McKinley said in 1901 that the brotherhood of fraternal societies was similar to the brotherhood of “equal citizenship” in the U.S. It is suggested that McKinley became a Mason upon observing fraternal kindnesses exchanged between Masons in the Union and Confederate Armies during the Civil War. Master Mason 1901, EA, FC, MM, in Matinecock Lodge No. 806, Oyster Bay, NY in 1901. Somewhat active, and very supportive of Freemasonry. Theodore Roosevelt, said in 1902, “One of the things that attracted me so greatly to Masonry . . . was that it really did live up to what we, as a government, are pledged to — of treating each man on his merits as a Man”. From Roosevelt’s obituary in the New York Times, January 1919: Colonel Roosevelt was a member of the local lodge of Masons, and never failed to keep up his interest in it. He had made a habit for many years of visiting Masonic lodges wherever he went, as a member of the Oyster Bay lodge, and, returning, to tell his brother Masons here of his visits. President Taft was made a Master Mason at Sight in Kilwinning Lodge No. 356, in Cincinnati, Ohio, in 1901. That made him a member at large, until the Grand Lodge issued a demit to Taft when he became a regular member of that lodge. Somewhat active, Taft was very supportive of Freemasonry. More on on Taft an Freemasonry from the National Heritage Museum: Making a Mason at Sight: The Case of President-Elect Taft. To the diversity of faith that Freemasonry supports, Tast was a member of the First Congregational-Unitarian Church which he joined at an early age through his parents. It is suggested that as he rose in government, he spent little time in Cincinnati. and attended the church infrequently worshiping when he could. President Harding received his Entered Apprentice Degree at Lodge No. 7O, in Marion, Ohio on June 28, 1901. He received no other degree until after becoming U.S. President, FC & MM in Marion Lodge No. 70 in 1920 (MM Aug. 27, 1920), Royal Arch Chapter degrees in Marion Chapter No. 62 in 1921; Knight Templar in Marion Commandery No. 36, in 1921, Scottish Rite and Shrine in 1921. Interestingly, Harding was blackballed on the first petition for membership in 1901 on objection and rumor over his heritage. That impediment was over come and he was made an Entered apprentice on June of that year, but delaying his further progress for nearly 20 years. Master Mason 1909, EA Feb. 9, 1909, Belton Lodge No. 450, Grandview, Missouri, MM 1909. In 1911, Truman was the 1st WM of the new Grandview Lodge No. 618. Grand Master of Missouri 1940-1941. Very active and supportive of Freemasonry, Master of Missouri Lodge of Research while U.S. President, Masonic Ritualist, district lecturer and deputy Grand Master for several years, buried with Masonic rites in Independence, MO, in televised ceremony. Ford was initiated September 30, 1949, at Malta Lodge No. 465, in Grand Rapids, Michigan, along with his half-brothers Thomas Gardner Ford (1918-1995), Richard Addison Ford and James Francis Ford. The Fellowcraft and Master Mason Degrees were Conferred by Columbia Lodge No. 3, Washington, D.C., on April 20 and May 18, 1951, as a courtesy to Malta Lodge. Brother Ford was made a Sovereign Grand Inspector General, 33rd degree, and Honorary Member, Supreme Council A.A.S.R. Northern Jurisdiction at the Academy of Music in Philadelphia, on September 26, 1962, for which he served as Exemplar (Representative) for his Class. Brother and President Ford was unanimously elected an Active Member of the International Supreme Council, Order of DeMolay and its Honorary Grand Master, at its Annual Session held at Orlando, Florida, April 6-9, 1975. Ford held this post until January 1977, at which time he became a Past Honorary Grand Master, receiving his Collar and Jewel on October 24, 1978 in Topeka, Kansas, from the Hon. Thomas C. Raum, Jr., Grand Master, Order of DeMolay. Lyndon B. Johnson was initiated on October 30, 1937 in Johnson City Lodge No. 561, at Johnson City, Texas. As having never completed his degrees, Johnson is not considered in this list as one of the Masonic Presidents. How about David Rice Atchison – President for one day on 4 March 1849. Also, wasn’t Lynden Johnson a Freemason? Johnson was only a First degree and so not included in the grouping of Master Masons. But Lyndon B. Johnson was initiated on October 30, 1937 in Johnson City Lodge No. 561, at Johnson City, Texas. And David Rice Atchison (1807-1886) was an “Ex-officio president for one day”, also not included, though he was a member of Platte Lodge No. 56, Mo. Are there any members 4rm Africa? Or may be membership is restricted only 2 the western world.. So theadore roosevelt and franklin roosevelt had the same exact thing to say about freemasonry? It sims to me that Lyndon Johnson was a Freemason of the First Degree and for having been such, he deserves recognition as a Prominent Freemason just like Simon Bolivar and General Douglas McArthur. Having been made a Mason with the conferring of the first degree LBJ was and should be considered a Mason whether or not he decided to accept further light is irrelevant! It would be ludicrous to infer otherwise; it would be like a baptized child being half a Christian because they were unconfirmed by the Bishop! Yes, Daniel, there are members of African decent. Depending on the state in which you are located, your Grand Lodge may or may not be at amity with the Grand Prince Hall Lodge in your state. Even if the Grand Lodge of your state is not at amity with Prince Hall, race is not a requirement. All petitioners must meet the same key criteria prior to joining and these criteria have nothing to do with race, color, heritage, wealth, etc. My lodge has Anglo Saxon, African, Asian, Arabic, Jewish, and South American members. Is it true that Santa Ana was a Free Mason and is that why his life was spared by Sam Huston, a fellow Mason, as San Jacinto? Our Great Father, Our Mentor and Inspiration, Our Family. I thought Thomas Jefferson and also James Madison were also Masons ? Both are suspected of being, but no hard tangible evidence has come to light. In many instances they associated with Freemasons (in many instances quite openly) but not in a way that verifiable records have been found. President Lyndon B Johnson, while only an Entered Apprentice, is by Texas Grand Lodge Law considered a Mason. Not withstanding the Masonic presidents, there is something much more sinister…. Those presidents who are skull and bones members (Yale senior society) I thought it rather funny when John Kerry & Bush were running against each other. BOTH were members of “Bones” (so who do you think won that election? Not democratic nor republican but rather Skull & Bones!) today the skull & Bones thing has caught more light so to speak, but what now gets no mention are the ppl who weren’t “tapped” by Bones (15 members each yr no more no less) but WERE “tapped” by Wolfs Head or Scroll and Key…. These are the other senior societies. Though Bones is the biggie, with ppl like Henry Luce, Rockefeller, Harrimans,Paynes and Whitneys n much much more on there rosters. The Bush family is so ingrained into Bones that it goes beyond Prescot Bushs involvement and into the Walker family…. Herbert Walker was Bones & where did the H.W in George Bushs Snr name came from? The Walker Family….. Skull & Bones intermarriage “policy” ensures that wealth stays n grows. So many tentative links….. I’d really like to see more about Wolfs Head and Scroll & Key, who’s members are important just not enough to make the Bones Grade. Mr Abiff: is very correct in what he explains concerning Kerry/Bush in the Skull and Bones. Whose controlling everything? They say it is the most secret society in the world. Freemason is of the devil, it is not Christian at all!! Harry Truman is burning in hell right now, so are the Roosevelt’s and Gerald Ford. JESUS is the ANSWER!!!! For great Masonic Founding Fathers, do not forget Paul Revere or, possibly the most influential of all, Joseph Warren from Massachusetts. Daniel Phiri, there are Masonic Lodges and Grand Lodges in most countries, including in Africa. Well word is that on his deathbed Washington converted to the one true universal Christian church founded by Jesus Himself. God bless them all. They done good job in their time. We will never understand because we are called the “profane” and God bless Christians in Christ alone … not some master architect as the luciferian/satanic lodges are and those in them. Come to Jesus now or eternally be lost in the fire. Come out of that Babylon entity, and be saved by the Holy Spirit of Truth, Amen! At the 30th degree, freemasons are taught that Lucifer is God which is a flat out lie. Reminds me of Scientology when you reach a certain degree you are told your body is full of alien souls ruled by an interplanetary being, Xenu. Freemasons are exposed as evil now, there is nothing good about men tricking other men into worshiping the devil. Upper level freemasons should all be in jail for fraud. Albert Pike was the leading Freemason in North America around the end of the 1800. He is a self proclaimed satan worshiper, and an illuminati, who said in his writings tjat freemasonry would use Islam to destroy tje christian west. Sounds like a club i want to be a member of, NOT! Grace, any student of classical history, or comparative religion knows that both the Greek and Roman pantheons had many gods. One of the Roman Gods was Lucifer, God of the morning star. The Roman’s also worshiped Lucina the Goddess of childbirth and Luna the Goddess of the moon, among others. The Greeks worshiped the morning star before the Roman’s but the Greek God of the morning star was called Phosphorus. It’s important to note that both the Greek God Phosphorus and the subsequent Roman God Lucifer were both God’s of the morning star and referred to the planet Venus. The dilemma here arises from Pike’s study in comparative religion as a means of education, and his reference of Lucifer as a god, NOT THE God. Albert Pike was a Christian who studied various religions extensively. Read the entire excerpt that includes his term Lucifer. Simply taking half a thought is not a fair analysis of a man. Michael, please source your claims about Pike. I’d be interested to read where a reputable source makes those claims. To the author: I appreciate your not including Brother Johnson in the list. When I think of famous Masons, I envision Master Masons. Anyone who has been raised to the degree of a MM understands the gulf of work between becoming an EA & an MM. @Rich Bradley – To try to compare it to salvation totally misrepresents the Craft. @Rosemary – I was told this story growing up and believed it. After I became a Mason, I viewed the story from a different perspective. No one really knows the answer, because Brother Houston never shared his reasoning for sparing Santa Anna, as far as I know. — Note that I do not refer to Santa Anna as Brother because of the Alamo. Many of my fellow Texas Masons believe (as I do) that, by the time of the Battle of San Jacinto, Santa Anna had exhibited so much unmasonic conduct that Sam Houston was under no Masonic obligation to him whatsoever and, as a result, the Masonic mercy story is most probably believable fiction. Personally, I have come to believe that General Houston spared him more out of pragmatism than nobility. He needed Santa Anna to control the Mexican army as they retreated from Texas. He was simply more valuable to Texas alive than dead. @Grace – This is just untrue… at least in York Rite. I sat through that degree with my father (a Baptist preacher) and I’d like to think that one of us would have picked up on that. I can assure that we would have walked out immediately if Masonry had tried to teach us that Lucifer = God at ANY point of ANY degree.